In September when our visitors all head back to their homes for school and work it seems like we all go broke. But our Kama‘aina Guide will help you go for broke when it comes to eating throughout the month. Our favorite restaurants, from the little hole in the wall to exclusive fine dining to our resorts, invite and entice us with a great meal and few extra dollars in our pockets. The month of September is full of cheap foodie adventure and we are going to fill your tasty dance card for 30 days with Tahitian prawns, pizza, salad bars, buffets and all kinds of other treats. 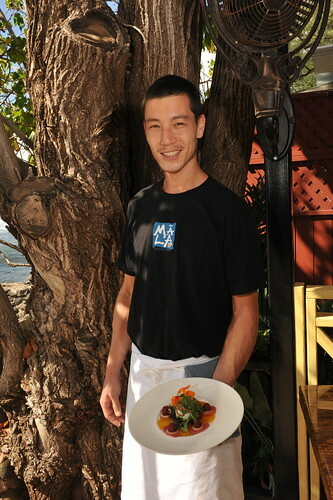 So keep our Taste of Maui issue with you all month long to give you the secrets to eating that you won’t find on Yelp. If you can keep up, that is. We all start the week with the temporary and painful break up from the Saturday on Sunday tryst. It’s Monday, so keep weekend remorse at bay with plans for next week. Pick up the phone and grab reservations for dinner at Lahaina Grill for next Monday where you will enjoy half off their scrumptious modern bistro entrees like their all American braised pork shank with Irish blue cheese mash, or lion paw scallops drizzled in lobster champagne essence. Since you have to wait a week in the meantime, enjoy half off of pizza at Fabiani’s in Kihei, voted Best New Restaurant in Best of Maui. Get settled into the week with 50-percent-off entrees like the green tea lacquered salmon with shiitake and spinach at the Ocean Pool Bar at the Westin Villas on Monday evenings. Treat yourself to a Cool Cat lunch on Tuesday–with 20 percent off, you can afford their creative and sometimes curious burger of the month. Climb out of the week’s mediocrity with help from an Indian dinner at Monsoon India–10 percent off for kama‘aina. Heave ho the humpday blues with a pau hana and pupus at Mai Tai Lounge for 10 percent off. For dinner, you and your work mate are headed to Koho to celebrate the weekday summit with their Wednesday fajita special: just $22 for two. Rest up because Thursdays will run long. Power lunch at Mulligan’s with $6 pupus all day, paired with a good Irish brew of course. With the papers piling up and you have to work late at the office, head straight to Sansei after 10pm with comrades to fill up on rainbow rolls and misoyaki butterfish, all washed down with Kirin till midnight. You’ll overdo it but that’s OK–it’s half off and you’re celebrating the nearness of Friday. Speaking of Friday, gather your besties and head to 100 Wines / Melting Pot for the first Friday of the month. There just $21 gets you a three-course dinner. Wow, Saturday morning rolled around awfully quick. Now’s your chance to pick up a few packages of delectable Maui Macaroons while you do your farmers market shopping at the Maui Swap Meet–it’s buy one, get one free. Two-fer your Saturday evening activity with a buy one entree, get one entree half off special at Three’s Bar and Grill, then stay late for the Eric McFadden show. We know Sunday morning can be brutal, so sleep in and play the day nice and slow. How bout a beach day at Napili Bay? Meander up to the Sea House Restaurant for 25 percent off breakfast or lunch. Sunday evening, you can cool off in the Upcountry air and carb-load at Casanova with their 20 percent off pasta and pizza special. Maui’s Best Italian food is the ideal way to cap your weekend. And it’s Monday again. Grab your MauiTime and look for the Wailuku Coffee Company coupon, rise and shine with a cup of their Maui Red Catuai this morning. Too busy to pack a lunch? Not a problem: Pad Thai offers a buy one, get one 50 percent off special for their namesake chicken. Save the leftovers for later. If Tuesday’s grind has got you in a headlock, South Maui’s Rodeo General will ride to your rescue. Pick up a round of healthy veggie or fruit smoothies for work with their buy one, get one free coupon in MauiTime. Later you can meet friends at Buzz’s Wharf to recap the weekend fun while you check in on Foursquare and order their seared ahi, coconut shrimp or paniolo burger sandwiches. They come with fries or mac salad and are half off this month. The hike to Wednesday feels more complete after the teishoku at Tokyo Tei: it’s just $11.50 all month to get authentic local Japanese culture at this third generation Wailuku mainstay and Best of Maui Best Japanese Winner. Maybe you want to take a drive to contemporary Japanese fusion cuisine later that night at Roy’s–their new location is gorgeous and a buy one, get one half off deal is the perfect way to enjoy it. If you’re in the mood for kalua pig, lunch it up at Aloha Mixed Plate with your 10 percent off coupon in MauiTime. Fritter part of Thursday away by indulging at Tutti Frutti, from 4:30-6pm it’s buy one, get one half off. When it’s time to warm up the vocal chords, start with a buy one entree, get one half off special at Stopwatch Sports Bar and Grill, then sing the night away with karaoke with Pearl Rose. Maybe you’re feeling back-to-back sportsbar love, so head to Lahaina Sports Bar (formerly Lahaina Cafe) for their all star lineup of $5 appetizers for lunch. There’s great wine and food this Friday with Mark Johnstone at Hotel Wailea’s Capische?, where their modern Italian cuisine is buy one, get one half off. Twenty percent off mac nut pancakes in the cool Stella Blues dining room is a great reason to roll out early Saturday morning. You have your whole day ahead of you! 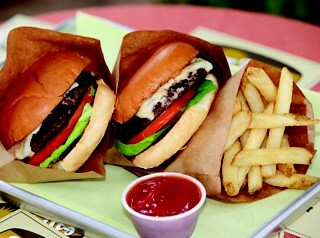 Grab burgers at Teddy’s Bigger Burgers in Lahaina with their coupon for a buy one, get one half off combo deal. 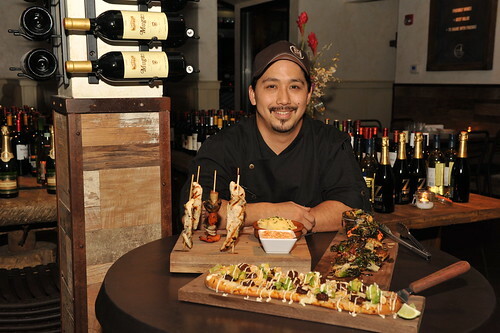 That night the Maui Jazz and Blues festival will go off at the Grand Wailea, so why not dine at Humuhumunukunukuapuaa first: their amazing dishes by Chef Lofaro will blow your mind but not your wallet, since you can buy one and get one half off. By now the late night of jazz must have your appetite going. Betty’s Beach Cafe has Sunday brunch and $2 champagne, but wear your sunglasses because their Lahaina beach view is stunning and sunny. After your leisurely afternoon nap, enjoy a sunset dinner at David Paul’s Island Grill, which offers 50 percent off certain entrees. In case you hadn’t noticed, Mondays is popular for Kama‘aina deals. It’s half off Round Table Pizza on Mondays all month if you mention MauiTime–it doesn’t get any easier than that. Haliimaile General Store will give you 50 percent off of your dinner entree when you bring in a nonperishable food item for the Maui Food Bank. What a great way to ease hunger on Maui! It’s now Day 16 in your Kama‘aina Guide and you’re feeling like staying in? How about printing Hawaiian Moons’ coupons off their website or just show it on your smart phone for a dollar off their salad or hot bar and take your healthy lunch or dinner to go. For comfort food Tuesday night, get the early bird seating at Joe’s in Wailea for dinner, where you can buy one entree and get one free. I’m thinking the meatloaf and the chicken and waffles. On Wednesday, we’re thinking of Paia. 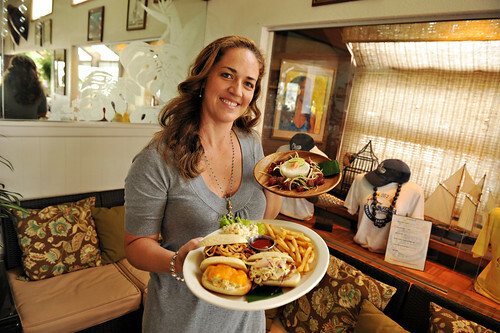 Milagros offers 15 percent off for kama‘aina during lunch and dinner, and Cafe Mambo’s Maui Cattle Co. burger and beer for $11 is tempting. If Kihei calls for dinner plans, then Kono’s on the Green is offering sushi half off from 3-5pm, then you can buy one entree and get one free from 5-6pm. Thursdays are best for bringing your office meeting to the Kahili’s buffet. Bring in a party of 10 or more and one person eats free. After a hard day’s work nothing could be better than the healthy and fresh seafood and pizza dishes at Honu, where they are still celebrating their one year anniversary by giving you an incredible 40 percent off from 4:30-6pm at the bar. Mala Ocean Tavern will offer it, too. On Friday, if you’re feeling like Chinese, head to Kahana’s China Boat and dine in for 20 percent off (all day) their yummy traditional Chinese cuisine that is never made with MSG. At pau hana, catch the cliff dive ceremony at Sheraton Maui before you head to Black Rock Steak and Seafood, where it’s buy one, get one half off. 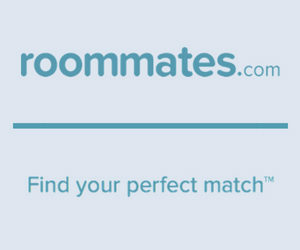 Looking for a little night life to dance off that meat and potatoes? Longhi’s is hosting FUNKadelic 2, a Burning Man decompression party and Source fundraiser. Saturday’s rolled around again and you know what to do: hit the listings in your MauiTime Taste of Maui. Italian food at Pulehu could be just the thing, where it’s 50 percent off. On Sunday, Gannon’s amazing Wailea hillside dining room tempts you with a fabulous menu by Bev Gannon and a buy one entree, get your second entree free deal. Now it’s the final week for kama‘aina in September. But Monday deals keep on keeping on with Paradise Grill’s half off breakfast from 7-8am. Sharky’s in Kihei has half price dinners. On Tuesday you can pick up any burger–from their hand-patted beef, turkey, pork or veggie selections–at Sure Thing from 3-5pm and get them for just $4. Dinner and the Kaanapali sunset couldn’t be sweeter at Castaway Cafe, where your pasta is buy one, get one free. For the rest of the month, you still have plenty of options. 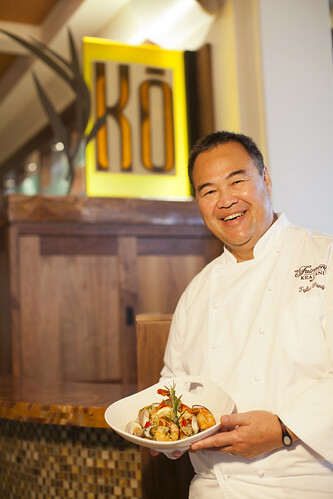 Dine at the bar at Fairmont Kea Lani’s Ko and you get 50 percent off your food and 25 percent of drinks. Four Seasons’ Spago, DUO and Ferraro all have a buy one, get one free deal with your valid ID. At the Ritz Carlton, go omakase at Kai Sushi from 5:30-6:30pm at get it half off. Merriman’s Kapalua has a 25 percent off special off at the bar and Monkeypod Kitchen in Wailea has half off appetizers from 3-5:30pm and 9-11pm. Now pat yourself on the back–you made it 30 days in September of kama‘aina. Feel free to kick your feet up and watch the season opener of Dexter and start looking forward to Halloween.